Roger Squier, Buffalo Auto Manufacturers Reprint. List of 30 manufacturers. ... the "stanhope" ... featured a single bench seat, folding cloth top, front buckboard, and tiller steering. A typical wealthy Buffalo couple might have two automobiles: an electric for the women in the family and a gasoline auto for the men in the family. The electric automobile was quiet, easy to operate, and emission-free; it was also heavy, slow, unable to climb hills, and in need of recharging after 20-50 miles. Such a vehicle was quickly marketed to women, doctors, delivery businesses and others residing in an urban environment where electricity for recharging was available. The gasoline automobile had already been adopted by men for its speed and "portability," i.e. it could "tour" in rural areas and be re-fueled at gasoline stations that quickly sprang up around Western New York. The Buffalo Automobile Club was a touring club for gasoline vehicles; its membership was male. 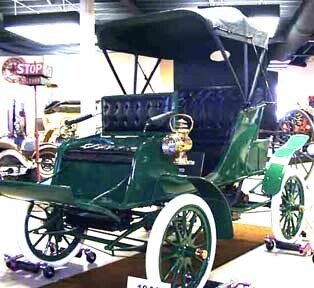 Although in 1900, equal numbers of electric-, gasoline- and steam-powered automobiles were produced in the U.S., it quickly became apparent that electrics would not succeed in competition with gasoline models (becoming more reliable each year) unless a revolution in the electric battery came about that would result in a lighter battery that would produce more power for a longer run per charge. Thomas Edison took on this challenge (see his optimism here) and did produce an early alkaline battery, but it was not powerful enough to replace the lead-acid battery then used in electrics.